Eric Weinstein’s Twitter bio says he’s the managing director for Thiel Capital. Weinstein’s tweet says that he’s a father to a daughter, and he apparently has issues with women in the workplace complaining about discrimination. Apparently, Weinstein has no issue with women sitting idly by and suffering at work while being harassed, and doesn’t care that women aren’t paid equally. 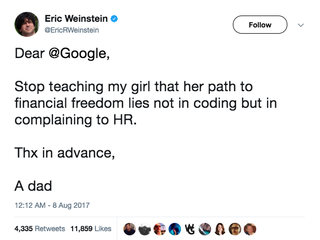 God forbid Weinstein’s daughter does land a coding job and she’s not paid the same as her male counterparts. You do not have to accept misogyny. No matter what your dad says.